India has about 480,000 road accidents of reasonable severity every year, and 33% of these are fatal, according to a 2016 report by the government’s Transport Research Wing. This is in sharp contrast to the United States (US) where only 2% of accident victims die. Cryer (2016) attributes this difference in survival to access to quality treatment in the first or “golden hour” of the accident. Now consider another category of emergency victims. According to the Accident-Statistical Year Book 2016, India has a 1% success rate in preventing deaths or permanent disability in the event of a cardiac arrest. In contrast, the success rate in the US was 5-6% as far back as the early 1980s. Over the years, with a greater focus on cardiopulmonary resuscitation (CPR) training in colleges and corporations, and widespread deployment of automated external defibrillators (AEDs), the survival rate in the US improved. By 2014, the US had a survival rate of 30% in bystander-witnessed cardiac arrests. An ambulance in India takes anywhere between 15 to 40 minutes to reach the incident site in urban areas and often much longer in rural areas. However, emergency care is not only about providing an ambulance. Although the ambulance plays a critical role, it is effective collaboration between various players in the emergency ecosystem that determines the difference between life and death. The problem with emergency care in developing nations, including India, is that it is cost prohibitive to replicate America’s 911 system of end-to-end collaboration for emergency care, which seeks to ensure that first responders reach the site of the incident within 8-10 minutes. 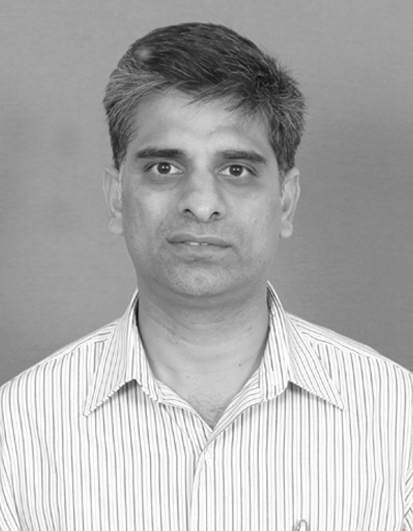 Nor is there a mechanism to collaborate seamlessly across various entities in the emergency ecosystem. 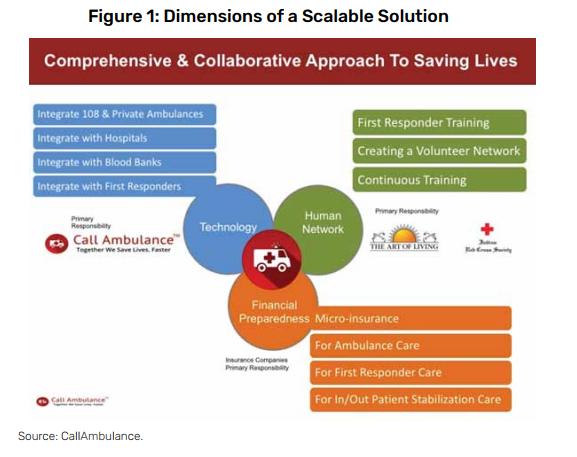 CallAmbulance is an emergency care platform that enables real-time collaboration between ambulance drivers, first responders, hospitals, blood banks, insurance companies and victims’ families in order to save lives. This new-generation, integrated emergency care ecosystem is made possible by mobile-enabled, application programming interface (API)-driven technologies. The catalyst for this platform was a road accident. On one of our road trips, we witnessed an accident that had left the driver of a scooter unconscious and the pillion rider bleeding profusely. We decided to take the pillion rider to the nearest hospital and while en route, called 108 to help the unconscious victim. We struggled to give the exact location of the incident, as there were no landmarks to guide the ambulance. That experience gave us an insight into how poor are the chances of surviving an accident in India. Our subsequent investigations into emergencies, interactions with the GVK Emergency Management and Research Institute and emergency care centres at various hospitals showed us how, in every respect, survival was a matter of luck. We realised that there are a number of touch points in emergency care that, when not coordinated, will result in the loss of lives. In India, one life is lost every four minutes in road accidents and one every minute due to cardiac arrest (Accident-Statistical Year Book, 2016). It is quite evident that for a resource-constrained country such as ours, we have to invent new solutions that will maximise the efficiency of our current system. A boilerplate, developed economy model is not going to work in the Indian context. In India, one life is lost every four minutes in road accidents and one every minute due to cardiac arrest. It is quite evident that for a resource-constrained country such as ours, we have to invent new solutions that will maximise the efficiency of our current system. Technology: Mobile-enabled, API-driven technology for seamless collaboration across various entities in the emergency ecosystem. Financial preparedness: Micro-insurance for accident-related stabilisation of care so that hospitals are not focussed on payment when attending to emergency care situations. Human network: Create a force of motivated volunteers or first responders with extensive training. The objective is for them to reach the accident location much faster than an ambulance can, to extend help to the distressed citizen. We see calling 108 for help as akin to whispering for help. Although it is a start, it is often just not good enough in an emergency. It is better to shout for help, so that not just 108 but anyone near the victim has an opportunity to step up and assist him or her. This is why mobile app-based calling is so important. It makes it possible to broadcast the emergency so that various constituents, such as the family, first responders, or private/ public ambulance services have the opportunity to provide assistance. Mobile-based calls can accurately direct assistance to the correct location using the device’s GPS and Google Maps. The family/ friends of the victim. The ambulance provider can reach the site of the emergency more quickly by having the precise GPS location information. The hospital can act immediately when it has the victim’s medical history and blood group information on hand. The victim’s insurance and family contact information also assures the hospital of being compensated for any medical treatment it provides and for receiving approvals for procedures. The first responder can quickly reach the location, provide first aid to the victim and also help the victim get to the nearest hospital. Police and transport departments can respond to accidents within their jurisdictions. The victim’s family is notified of the emergency and can view the status of the emergency online with a custom URL. Family members can call any of the people assisting in the emergency and travel to the victim’s location. Once the victim is picked up, the ambulance driver can notify the destination hospital so that it is prepared for the patient’s arrival and treatment. About 70% of emergencies are health-related. People at high risk of a medical emergency can be better prepared for such an eventuality with the mobile app, which holds their complete health information and facilitates blood group identification. The app strengthens the ability to choose hospitals and treatment options. Such information empowers the emergency physician to provide more effective care. Using the address book of the user, the CallAmbulance app identifies a list of blood donors among the patient’s family and friends. Knowing who to rely on for blood at the critical moment goes a long way in saving time, and possibly lives. The platform’s API-driven technology will enable future integration with Internet of Things (IoT) devices so that any device that senses an emergency situation can alert the platform. For example, a sensor that recognises airbag deployment in a car or a thermal sensor that detects fire in a building can send a data request to the platform seeking emergency intervention. Mobile-enabled technologies also help to crowdsource assistance to high-risk, accident-prone locations. They help municipal and local agencies address problems with greater transparency and effectiveness. Mobile-enabled technologies can help bring private ambulances into networks of ambulances, especially in rural areas, using slightly different business models. This is being done effectively in the US and can be attempted in India as well, given that securing public ambulances to cover every corner of the country is cost prohibitive. Lastly, mobile technology can be very empowering for a consumer. Mobile technology allows for bytesized videos and infographics-based educational material on emergency care to be delivered to the user periodically. This material can provide specific tools and information to consumers based on their health condition. They can help high-risk families be better prepared for emergencies. If such material can be provided in the local language of the user, it can have an even greater impact. The world over, trained first responders have been instrumental in keeping victims alive until they can be transported to a hospital. They have been particularly effective in helping cardiac and trauma accident victims. To build a network of first responders, people can be trained in first response and graded on a scale. The best could rise to become full-time first responders, eventually being paid by the government in locations where hospital services are scarce. Mobile app-based calling makes it possible to broadcast the emergency so that various constituents, such as the family, first responders, or private/ public ambulance services, have the opportunity to provide assistance. Some pilot programmes are already underway; for example, Srikakulam Road Transport Organisation (RTO) gives driving licences to prospective applicants only after they have undergone basic training in first response. With the passage of the Good Samaritan law in May 2015, any citizen acting in good faith to help an accident victim is protected from pressure by law enforcement to disclose their identity or appear in court. This gives first responders in an emergency situation adequate legal protection from harassment. Previously, the police, courts and even the hospital could hold a Good Samaritan to ransom for the payment of the victim’s medical dues through constant harassment. We found, time and again, that this was the biggest deterrent for members of the public to provide assistance in emergency. With the new law in place, it is vital that the government and non-governmental organisations (NGOs) educate citizens about its purpose and scope. Provide first responder training to students in the age group of 14-18 years so that the next generation is better prepared to deal with emergencies both at home and in public places. Use mobile technology to map first responder network density across the nation. This could help to ensure coverage in remote locations. Work with AED manufacturers to identify and map locations where AEDs are available. First responders could then deposit an identity card such as an Aadhaar card and use the AED to help a victim. Set up emergency call centres across the country to be operated by emergency doctors who can remotely assist first responders in real time on their mobile phones using 4G communications. Engage corporations in building the network of first responders and AEDs as part of their corporate social responsibility initiatives. This could be through training first responders in different categories of emergencies and by “adopting” a geography to ensure it has the right density of AEDs. In advanced countries around the world, private and public hospitals are required to treat emergency victims regardless of the financial implications. Even if such a law were to be enacted in India (as a few states have done), it might not help much because many private and public hospitals will find innovative ways to avoid admitting or treating the patient. The approach we recommend is to create emergency coverage insurance policies. To start with, an affordable micro-insurance policy is needed to cover ambulance expenses. Since the majority of insurance policies in India do not cover outpatient charges, the micro-insurance policy should cover both inpatient and outpatient expenses for road accidents. A policy of this nature was launched by Apollo Munich Insurance Company for customers of CallAmbulance on January 1, 2018. What micro-insurance policies do is empower consumers to pick the right hospital for the right kind of emergency service. This will allow 108 ambulances to take victims to private hospitals and possibly charge the insurance provider a premium for the service. With the CallAmbulance app, microinsurance providers can reduce service and renewal costs, thereby making it possible to keep the costs to the consumers low. Put differently, CallAmbulance envisions this as a path to systematically improve the survival rate in India and transform emergency care. Cryer, G (2016). “The Golden Hour of Trauma Care: Past, Present and Future”, Presentation at the Annual Conference of the Society of Trauma Nurses. Creating an Integrated Emergency Care Ecosystem.